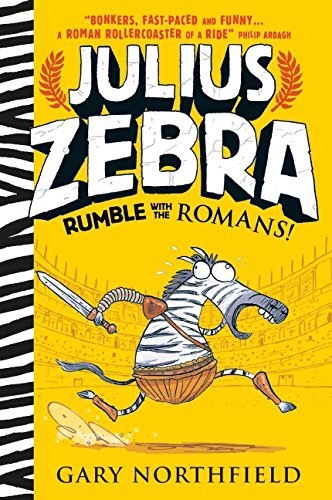 Julius Zebra: Rumble with the Romans is the latest book by Gary Northfield, the multi-talented cartoonist best known for Derek the Sheep, Gary’s Garden, and my personal favourite, The Terrible Tales of the Teenytinysaurs! which was one of my favourite books of 2013. It’s the story of Julius, who’s definitely not a horse, and is definitely not called Debra, who is separated from his mother and brother at the stinky watering hole and captured by a strange man with a bird on his head. It turns out this strange man is a Roman centurion, and initially Julius and the other captured animals think they’re being taken to a circus (juggling monkeys!) but it turns out it’s some other kind of entertainment – and I think the cover provides enough clues that to say that Julius and pals end up as gladiators isn’t much of a spoiler. The format works brilliantly – the book is heavily, heavily illustrated, with some sections containing what amounts to mini comic strips. The training scroll that Julius uses to record his journey to becoming a gladiator is an excellent insert, complete with Julius’ own illustrations. The humour is exactly what you would expect from Gary Northfield. There’s a joke about poo on page 14. (Sorry, I meant page XIV – all the pages are numbered with Roman numerals, and there’s a handy guide at the back if your Roman arithmetic is a bit rusty.) There’s a lot of frenetic shouting and panic, some examples of blatant stupidity that cracked me up, but the book never forgets that it’s an adventure story, and the humour keeps the plot whizzing along. I read it in one session – I just couldn’t put it down. One thing that struck me is how historically accurate the book is (talking zebras and vegetarian crocodiles aside). The author has obviously done a significant amount of research on the period, and that makes the setting all the richer. Some of the pictures of sweeping Roman cityscapes are jaw-dropping in their detail. Now, I’m not claiming to be an expert in the period. My degree in Classics was a very long time ago now, but there was nothing that struck me as inaccurate in the book. It’s educational! Battle of Alesia: A very important battle for the Roman General, Julius Caesar, which took place in 52BC. When he finally defeated the pesky Gauls, Julius strengthened his power in Rome, eventually becoming Emperor six years later. Oh dear, Gary. No. No, he didn’t. Gaius Julius Caesar was never Emperor, only Dictator. The first Roman Emperor was Augustus, who was Julius Caesar’s heir. Still, don’t let that one little slip worry you. It’s a fantastic book, full of humour and adventure, and heartily recommended. Sequel please!